Opposite the Lobkowicz Palace and neighbouring the Black Tower you notice the Supreme Bulgrave’s House. It used to belong to a very important person in the past – to the supreme burgrave – the highest official and the deputy of the king. This office was served by the most prominent members of noble families. The original Gothic house was built in the 13th century, then restored several times. 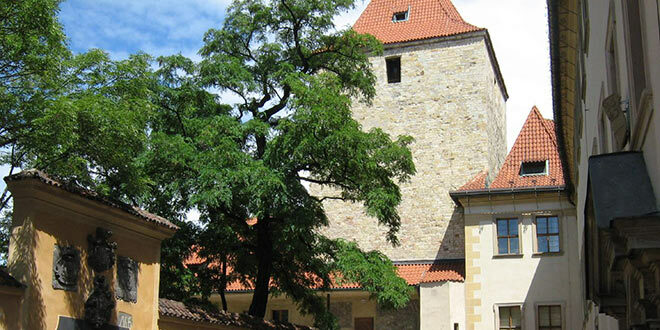 For a short time it was a contemporary accommodation for the Czech king and the Roman emperor Karel IV. In his autobiography Vita Caroli remembers strange things happening there, such as ghosts throwing glasses and tipping the furniture over. It’s not clear whether the house is really haunted or whether these ghost stories weren’t the result of immoderate drinking of wine. Today’s Renaissance look comes from the year 1555, when the house had to be reconstructed after a great fire. The Baroque gate from Jirska Street is decorated by the coats of arms of four important burgraves from the 17th and 18th century and the facade of the house by Renaissance sgraffito. The interior is the joint work of several prominent artists; notice especially the imposing paintings on the ceiling on the first floor. In the area of the Supreme Burgrave’s House you can visit exhibitions of fine art. The northern wing serves as the Toy Museum, which contains a vast collection of toys, from ancient Rome to the present day. The museum holds a large collection of Barbie Dolls. Every summer the area in front of the house comes to life. The court of the house is full of admirers of Shakespeare’s plays thanks to the very popular open-air Summer Shakespeare Festival. 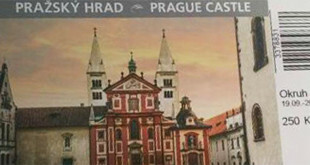 How to get there: you can get there from the east via the Old Castle Steps leading not far from Malostranska metro station (green line A) or from the west along St Vitus cathedral.